No need for Excel Services! Dynamic, interactive & amazingly-looking charts at the best price! Easily create dynamic & interactive charts based on various data source types in just a few minutes! KWizCom’s Charts for SharePoint web part includes unique features that overcome SharePoint’s charting limitations. 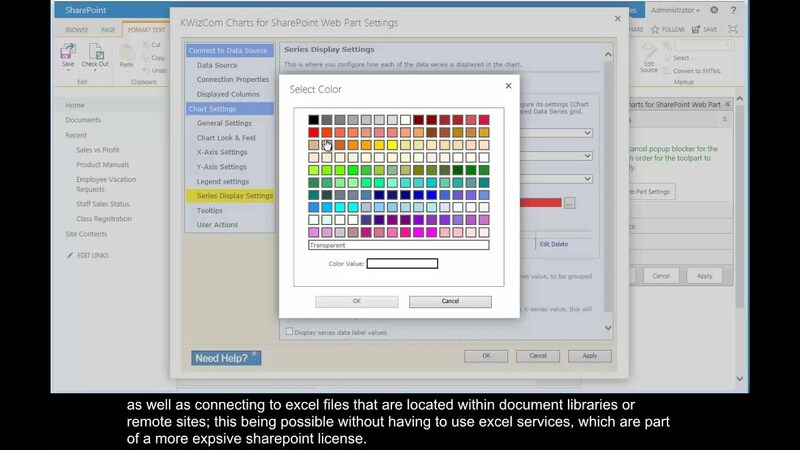 You can now easily display charts based on Excel files without having to purchase SharePoint Enterprise licenses! Need to chart aggregated data? With KWizCom’s Charts for SharePoint Professional edition you can easily aggregate and chart data from multiple sites. End-users can also filter the displayed data by using a configurable filter web part! Great-looking & highly customizable Organization Chart! Single Server License: Charts for SharePoint Std. Single Server License: Charts for SharePoint Pro.